#10 Philadelphia Phillies (1952): Great design, and an excellent combination of the Liberty Bell and baseball. The type actually uses scale (not typical in this era), which gives the viewer a cue as to which information is the most important. #9 New York Yankees (2008): The logo is well-designed. The ambiance of old Yankee Stadium is noticeable, but not overpowering, and the pinstripes are a great touch. The logo does get a little outline-happy when placed on a dark background, however. #8 Detroit Tigers (2005): The Old English capitals letters give the logo a unique, Detroit Tigers, look. The architecture at the top of the logo, with the bats on the sides, crop the logo well, giving it the shape of a baseball field. Lastly, the whole design has a steely look, which is a great tie-in the the Motor City. #7 San Diego Padres (1978): Simple, but effective. The type is clear and readable, while the swinging friar gives the whole package a fun, albeit somewhat campy, feel. In addition, the brown and yellow color scheme is unique in a league where about one third of the teams are blue and red. #6 Texas Rangers (1995): This logo would be just as at home in 2010 as 1995. ALL-STAR GAME is clear and readable, while the rest of the sheriff's badge theme supports the primary information. Sometimes less is more, and this logo is a great example of that. #5 San Francisco Giants (2007): This mark is quite a departure from the general theme of stars and bold lines. The logo has a vintage feel that would look just as good in the 1940s or 50s as it does today, in part because of the typeface used. The mark displays a scene that Giants fans are all too familiar with: a home run ball flying over the right field seats and into McCovey's Cove. This is the definition of expertly designed and incredibly original. 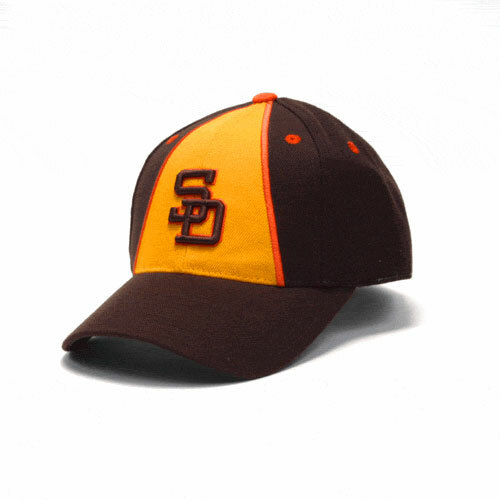 #4 St. Louis Browns (1948): So simple, yet so fitting… or fitted. This cap-based logo is one of the best marks to come from the first 50 years of the game. The type, while not developed to today's standards with custom typefaces and the use of scale for impact, is effective because there aren't a bunch of graphic elements cluttering the space. The colors are unique and help position this logo among the best. #3 Boston Red Sox (1999): This logo excels at promoting the Fenway Park's "Green Monster" as the Home Run Derby continued to gain popularity among fans. The mark displays the left field wall as an insurmountable feat, giving those who launched baseballs over it a type of "hero" status. The type is beautifully placed to look as if it was part of the wall, instead of just floating over it. All in all, a great logo. I don't know how they will top it the next time the game returns to Boston. 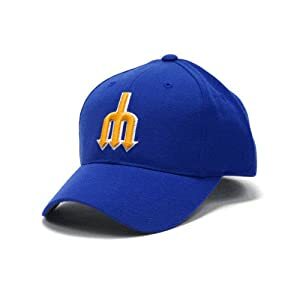 #2 Seattle Mariners (1979): Any time an All-Star Game logo becomes the primary mark of a team's identity, it deserves to make the list. And that was exactly the case with this mark. The Seattle Mariners adopted it as their primary logo over this after the '79 season. While the type isn't great, the mark itself more than makes up for it. #1 St. Louis Cardinals (2009): Where do I begin? Everything is wonderfully put together. The custom wordmark is excellently rendered, while the bird-on-a-bat is the perfect subtle nod to the team. The arch in the background pays homage to the city of St. Louis for hosting the event as well. The only thing I don't like about this logo is the use of Copperplate, but it's pretty small and not the focus of the mark, so I can live with it. #10 San Francisco Giants (1961): It looks like the Golden Gate Bridge is going to fall into the Bay. While the individual pieces of the logo are well-rendered, the way the pieces were put together leaves a lot to be desired. #9 Chicago White Sox (2003): Once again, the individual pieces aren't terrible, but they don't relate to each other. 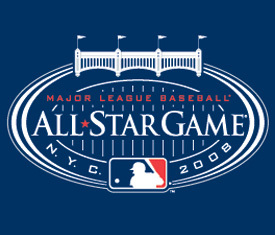 The typeface of 2003 is fairly curvy, and doesn't look right next to the squared-off look of ALL-STAR GAME. The logo also uses too many colors: black, dark grey, light grey, red, blue, and even green for a total of six colors (plus white). It's unecessary. The mark could be streamlined to use only black, two greys, and red, making it four colors (plus white). Not the worst logo, but on the list. #8 Cincinnati Reds (1953): Don't get me wrong, I think Mr. Redlegs is a fantastic mark. But everything else in this logo is poorly done. The way CINCINNATI and ALL STAR GAME are positioned is incredibly awkward, and the straight-on placement of 1953 only adds to the uneasiness of this mark. #7 Houston Astros (1986): This logo has too much going on. It's to the point where the game had an alternate logo because they couldn't reproduce all of the gradients and text effects in the primary mark. Although the logo represents Texas, it says nothing about the Astros or Houston's space program, which the Astros have used as inspiration in their identity throughout most of their history. #6 Baltimore Orioles (1993): Although this logo does say "All-Star", it doesn't give the viewer any clue about the host city or team. It just looks rushed and/or lazy. A little effort could have gone a long way. #5 Detroit Tigers (1971): This logo looks like a mark for an American Legion Fourth of July softball game more than a Detriot Tigers hosted All-Star Game. There is no indication of the Tigers, the city of Detroit, or All-Stars. This logo is terribly misguided. #4 Atlanta Braves (2000): Kudos on incorporating the All-Star elements, but shame for not letting anyone read them. Red type with a blue drop shadow = more vibration than your eyes can handle. The subtle baseball is good, but this logo could desperately use refinement and a typographer who has a clue. It's a mess. #3 Chicago Cubs (1990): My eyes! Wow, this is poorly constructed. First off, CHICAGO isn't properly centered. Second, why is there a white outline between the gold and black on the outside of 1990, but the inside of the number goes directly from gold to black? And I'm only now getting to the gradients, which are awful. Whose job was it to make this? #2 Los Angeles Dodgers (1959): If this logo were made today, the All-Star Game would be boycotted quicker than next year's game in Arizona. Why on earth, when Hollywood is next door, would this be your inspiration. I realize it was a different time, but there are numerous other things they could have used as the basis of this logo. #1 Pittsburgh Pirates (2006): I'll call this the "Technicolor Dreamlogo". It features every color in the rainbow, plus black and a second blue. For those of you scoring at home, that 8 colors (plus white). An 8-color logo is ridiculous no matter how rich the client is. Furthermore, the illustration looks like it belongs in 1996, not 2006. Given that the business of sports branding has evolved into a multimillion dollar industry, it's surprising something this bad was used so recently. This week, we have another "Double Play Design" section. 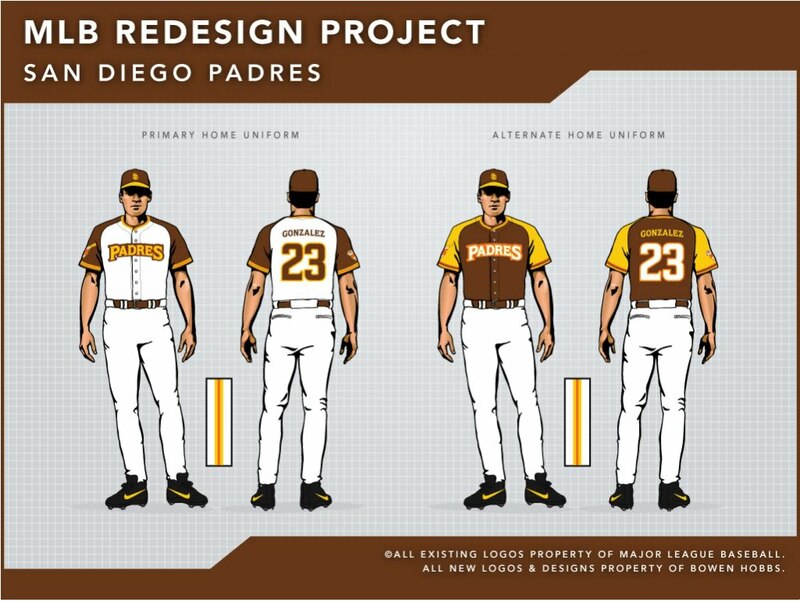 Up first, are the San Diego Padres, who are rumored to have new uniforms for next year. 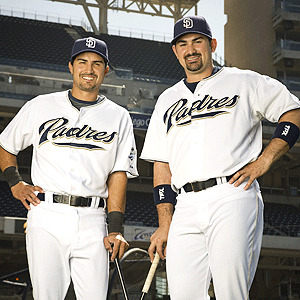 I've always thought the current Padres colors looked like a knock-off of the Brewers. 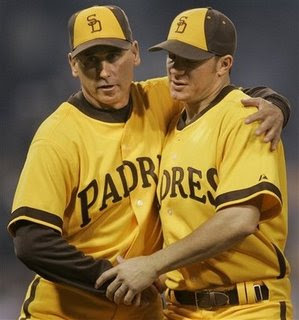 In addition, the Padres' most unique color schemes (and they've had plenty) involved brown. 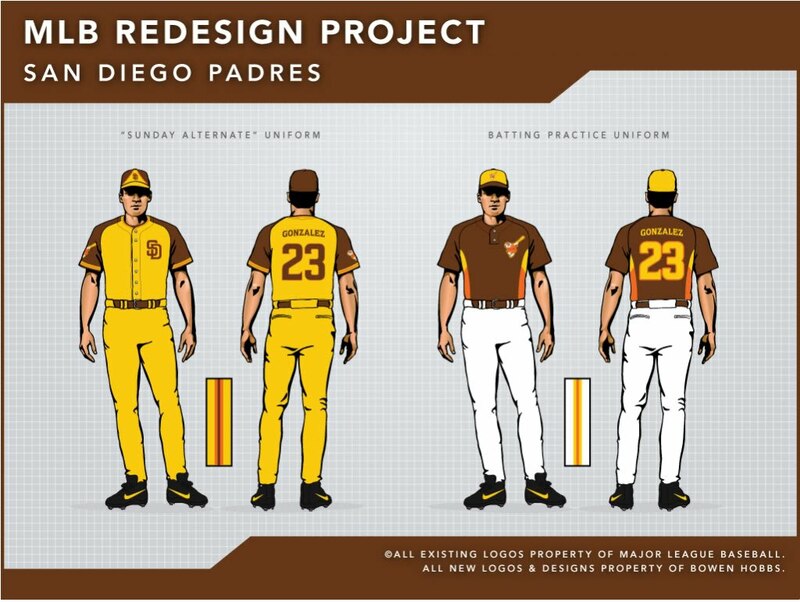 So I started with brown, and I added yellow and orange to round out the scheme and remind fans of the 1984 National League Champion team. For the primary logo, I kept the swinging friar and developed a wordmark that match the style and theme of said friar. In addition, the friar is outlined in orange and yellow, giving the logo a "heavenly glow". 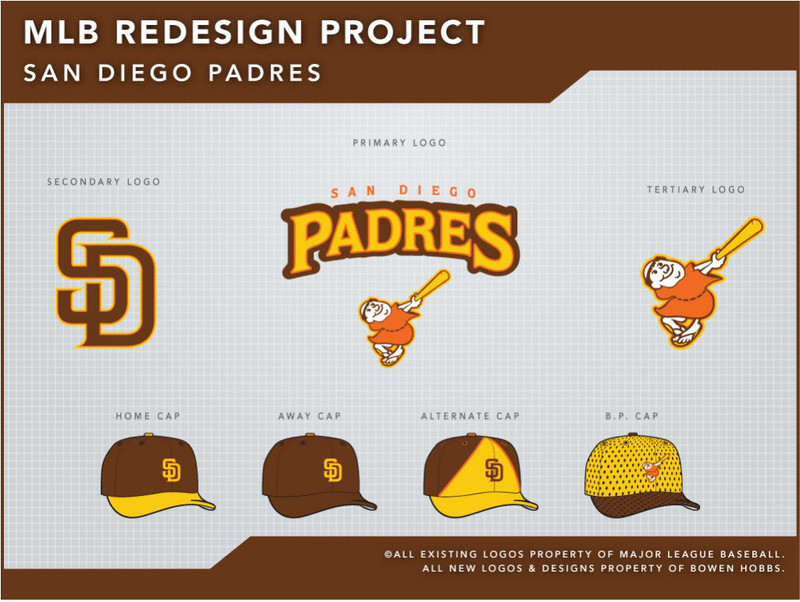 The secondary logo is the current incarnation of the SD, but brown with the orange and yellow outlines. The tertiary is a standalone friar, to be worn as a sleeve patch. The uniforms are a significant departure from the current scheme, with contrasting raglan-cut sleeves. 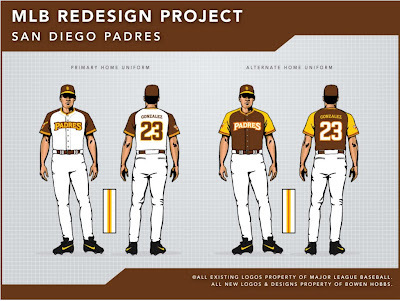 The homes start with a white base and the PADRES wordmark appears across the chest in yellow. The sleeves are brown and the jerseys feature a yellow/orange/yellow faux v-neck trim. The home alternate jerseys are brown with yellow sleeves and white type. The away sets use a pastel yellow base and SAN DIEGO wordmarks. In addition, the alternate road jerseys are brown with yellow sleeves and pastel yellow type. The Sunday Alternate starts with a modified version of this cap, complete with all-yellow uniforms. The SD logo appears on the left chest, and the pants use an orange/brown/orange stripe. 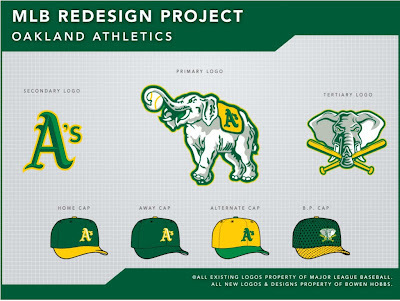 Second, we have the Oakland Athletics. 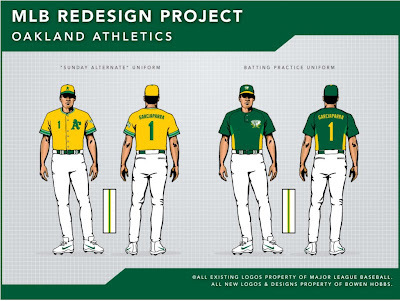 The A's are also rumored to be getting a new uniform, replacing their nonsensical black alternate jerseys with throwback-inspired yellow jerseys.For the A's I wanted to use more of their signature colors, as they are the only team in MLB to not use black, navy, royal, or red as their primary color. 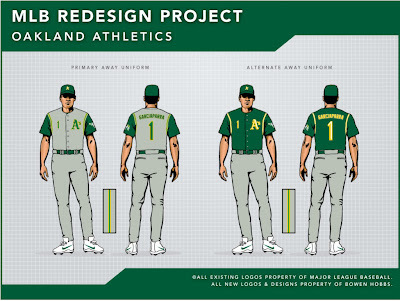 I also added kelly green (which is closer to what they wore in the 70s) to give the team a multi-tonal look, allowing for more versatility in their color scheme. The primary logo is a modified version of what the Philadelphia A's used from 1940 to 1953, while the secondary is the classic A's logo, but with a beveled effect. The tertiary is based an alternate logo the team used during the 1993 and 1994 seasons. With that mark, I altered the eyes and further developed the shading. 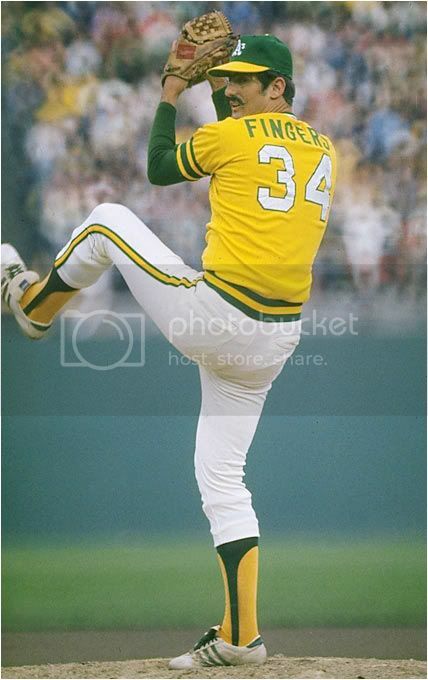 The home uniforms start with a white base, as the A's are the only team in MLB to mandate white shoes. They are paired with a green cap that features a yellow brim. The jerseys are vests (to show off more of their signature colors) with trim the wraps around the shoulders. 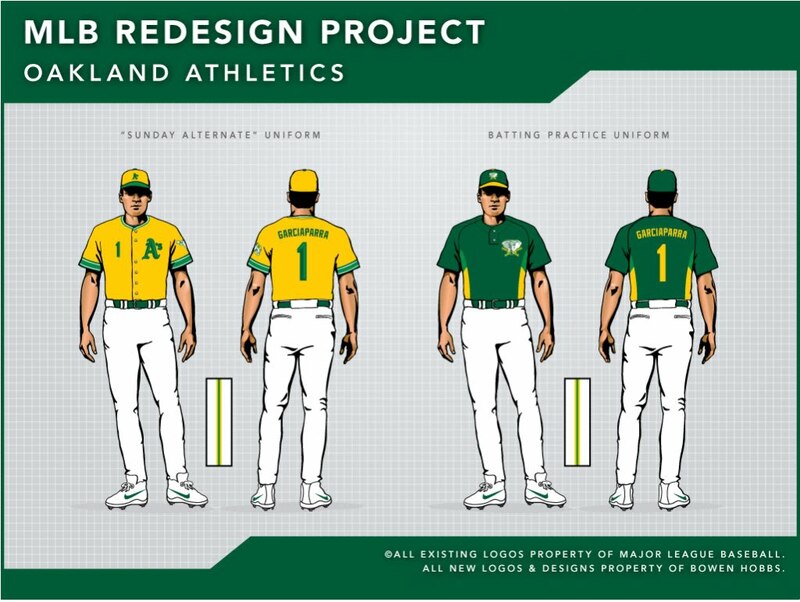 The A's logo appears on the left chest of all the jerseys as a nod to the teams of yesteryear. The player number also appears on the right chest. The home alternate jerseys are green vests with yellow undershirts, matching the color scheme of the caps. The away sets use a grey base that has a tinge of green in it. The road caps are solid green with the beveled A's logo. The away alternate jerseys are the same green vests as the home alternates, but are paired with a green undershirt. The Sunday Alternates take the concept of a yellow jersey and add thick sleeve stripes for a distinctly retro look. The yellow jerseys are paired with a yellow hat that has a kelly green brim. Feel free to leave a comment on the best and worst MLB All-Star Game logos, the designs above, or anything related to sports branding.